Cobblers midfielder Shaun McWilliams has undergone a scan to assess the damage of the hamstring strain he suffered in training last week. The 20-year-old has been out of the first team match day picture in recent weeks, not featuring since the 2-1 win at Stevenage on February 23, but is still seen a key member of the Town squad, and manager Keith Curle is keeping his fingers crossed the injury is not a serious one. Speaking to the media on Tuesday morning, the Town manager said: “Shaun had a scan yesterday, and we are just waiting to get the results. “When we do that we will find out how it is, but we are just hoping that it is a monor tweak. “So it could be four or five days out, it might be a week, or he might even be available for the weekend depending on the severity of it. Striker Junior Morias is currently unavailable as he recovers from an appendix operation, but ahead of the trip to Cheltenham Town on Saturday the only other player unavailable is loanee left-back George Cox. The 21-year-old hasn’t played since damaging ankle ligaments at Cambridge United in January, but Curle says he is closing in on a playing return. 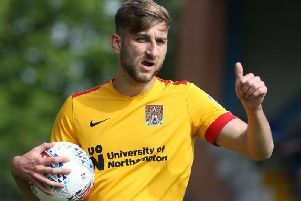 “I have spoken to George and he is desperate to come back up here,” said the Cobblers boss. “He is just waiting for the green light from Brighton to be able to resume field-based rehabilitation with us. “There is no point in him coming back up as he is not field-based yet, and when he does come back he will be set on a return to training programme. “He will be assessed by Nacho, and then assessed by Pablo to establish where he is at, because when players come back they have to hit the ground running.